Nokia has unveiled a simple £13 mobile phone that can last for 35 days on a single charge. It is aimed at emerging markets where electricity is rare, but could also be sold as a back-up phone. 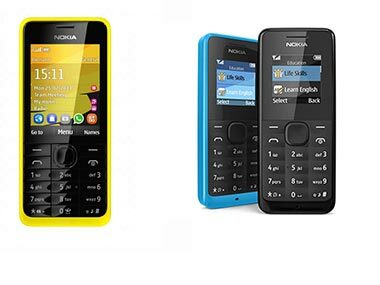 The Nokia 105, which is set to go on sale within weeks, has a colour screen, built-in torch and an FM radio. It’s now the cheapest phone in the Finnish firm’s range, and was hailed as ‘the ultimate festival phone’ at its launch. A spokesman for Nokia said: ‘The phone was created to offer the essentials – phone calls and SMS – but also some desirable extras. I want to start believing that owning a gun is now considered a household item in South Africa, going by the spate of shooting and killing. Gospel singer, Lanre‘Atorise’Teriba was in South Africa on the 15th of this month to perform at a Valentine show tagged Praise Night Concert. But things went another way after the show was over. He was attacked by unknown gunmen and was shot in the leg. His phones, Ipad and Gold wrist watch were all taken from him. He was immediately rushed to a nearby hospital. Another musician Dele Taiwo was present at the show but wasn’t attacked.